Over the summer I acquired a vintage keyboard that matched the one used on the Smithsonian’s Apple 1 Computer. 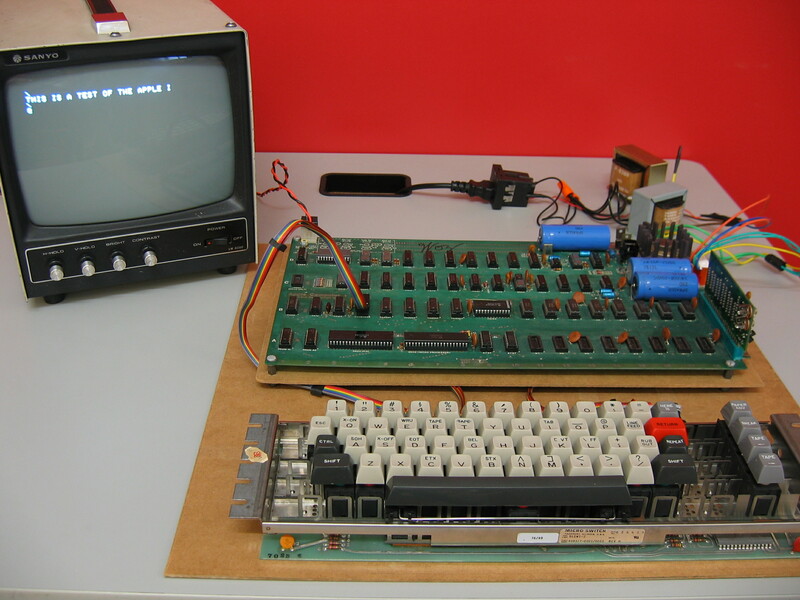 Some investigation revealed that this is the keyboard that Texas Instruments used in their TI Silent 700 series of terminals. This keyboard (Micro Switch part 56SW5-2 or Texas Instruments part 959327-0001/0003) was one of the models used by the 733 ASR/KSR terminal. The REPEAT, BREAK, HERE IS, and PAPER ADVance switches are all connected through a 10k resistor to +5v, and connect to ground when pressed. 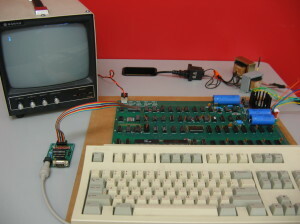 I connected the data, power and ground connections directly to the corresponding pins on the Apple 1 keyboard connector. 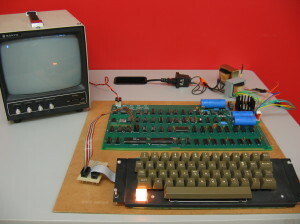 The reset input was connected to the BREAK key, as the Apple 1 expects a connection to ground when pressed. However, before using the Apple 1 or Mimeo, the screen needs to be cleared. The Apple 1 is designed for a connection to +5v through a normally open switch, which is not provided by this keyboard. In this part of the Apple 1’s design, the inputs to the chips at C8 and C9 are normally held low by resistor R15. Besides being driven by the clear screen button, the inputs are also driven by an inverter at D12, through diode CR4. 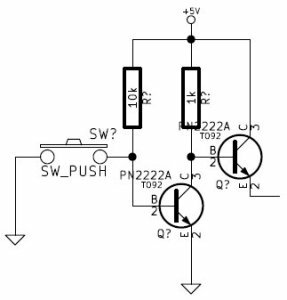 The diode protects the output of the inverter from to much current when the +5v is supplied during the time when the clear screen button is pressed and the inverter output is low. There are many ways to convert the active low signal from the keyboard to the active high signal required. One option is to insert an inverter between the keyboard and the input on the Apple 1. This would require an additional diode to be placed to protect the normally low output from that inverter when the inverter at D12 drives it high. This creates a wired-or style circuit. 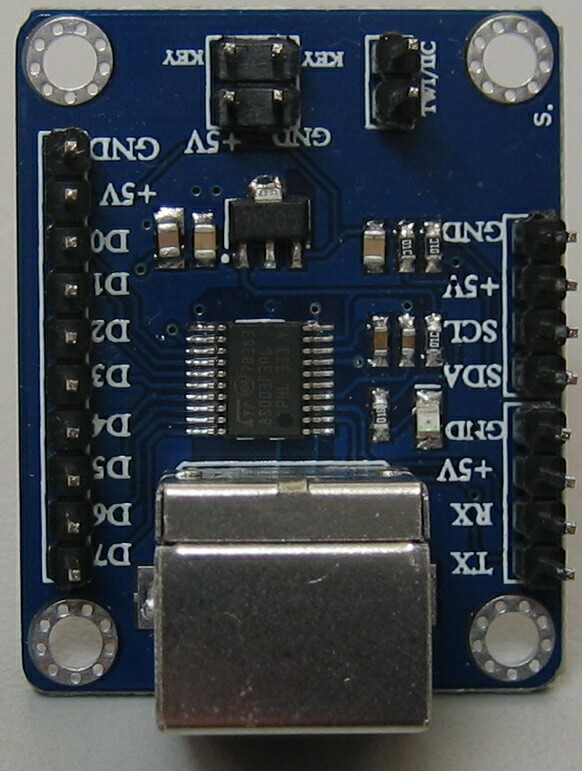 The keyboard itself has one unused NAND gate with one input connected to +5v. 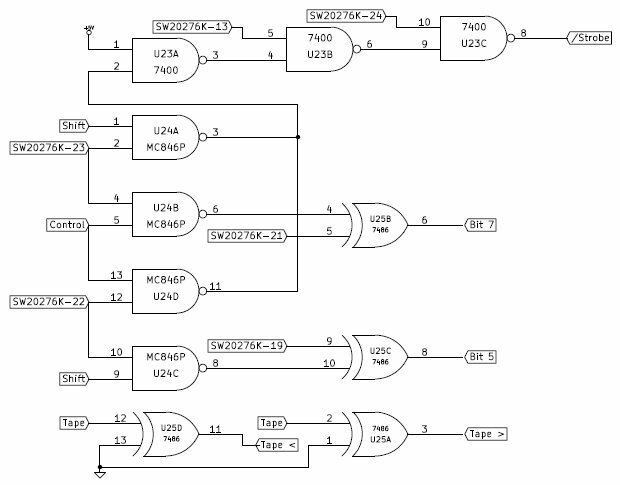 The second input and output appear to not be connected. Normally, I would have cut the trace from one of the extra buttons and routed the signal through the NAND and back to the output trace. However, I was hesitant to make permanent changes to the keyboard. I may wish to use it elsewhere! 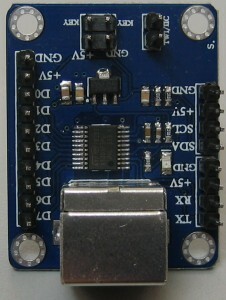 I could also have added an external chip to perform the inversion. However, I felt that this would be a waste as most of the chip would be unused. In either of these cases, I would still need to insert the diode to protect the gate. 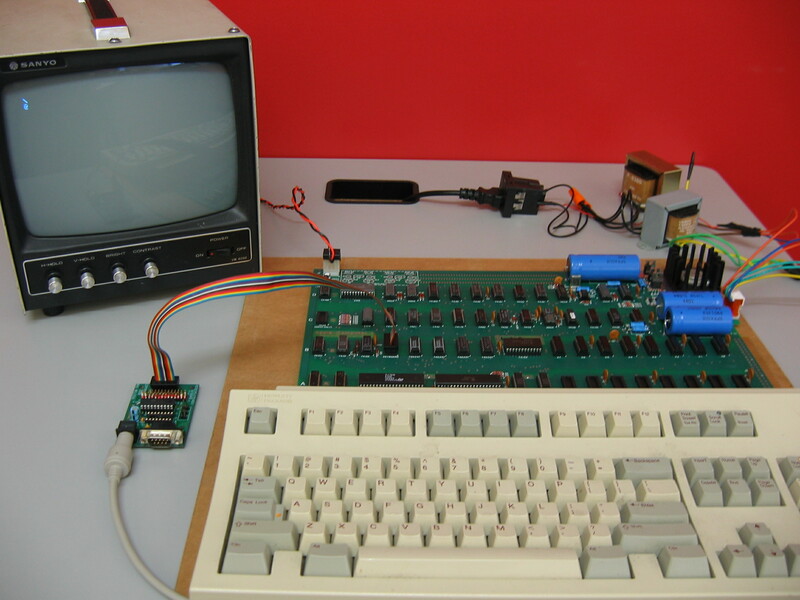 I wanted to look for an alternative method to adapt the output from the keyboard to the input that the Apple 1 expects. I knew from my circuits classes that a transistor can be used as an inverter. 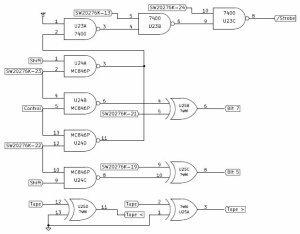 With some careful trial and error on a breadboard, I was able to simulate the circuit on the keyboard, and correctly design an inverter that would properly drive the clear screen input on the Apple 1. 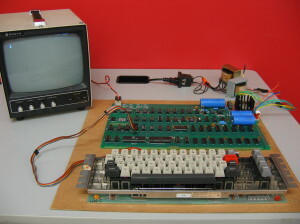 With this final piece of the puzzle solved, I soldered the parts to the connector to the keyboard along with the wiring for the Apple 1 interface. At this point, I made the choice to map the clear screen switch to the PAPER ADVance key. I tested it one more time with a breadboard, to ensure that the circuit worked correctly, and then connected it to the Mimeo above. The clear screen and reset options worked perfectly. Lastly, I tried the keyboard out on an Apple 1 Computer, with the results below. Many years ago, I worked on repairing an Apple 1 computer. 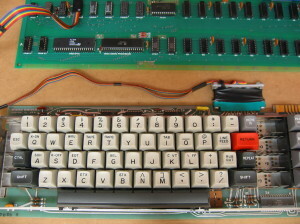 At the time, I needed a keyboard and came up with a simple wire wrapped circuit to translate the signals from the Apple II keyboard connector to that expected by the Apple 1 computer. Wiring the two devices together was easy, with one exception. The Apple II keyboard has no switch for clearing the screen. Rather than alter the keyboard, I left two wires exposed for the +5v and clear screen connections, which clear the screen when touched gently together. Wendell Sander has instructions on how the Apple II keyboard can be wired to the Apple 1 computer’s keyboard input, as well as how it can be modified to use the repeat key as a clear screen key. For those interested in a board they can simply purchase and use, VintageMicros sells a small adapter board, which includes a clear screen button.